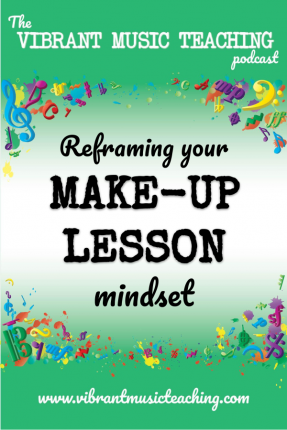 Do you reschedule your music lessons or offer makeup lessons? I’m here to convince you that you need to rethink that. 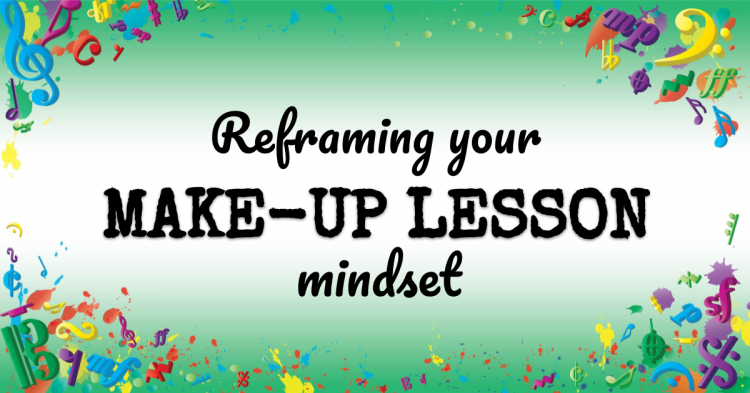 Join me for this podcast episode and reframe your makeup lesson mindset for good. Welcome back to the vibrant music teaching podcast. And if it’s your first time here please make sure to subscribe and also to go back through the archives there as well 18 episodes we’re on Episode 19 now. So there’s a lot still to listen to and it’s all still totally relevant to you and your studio before I kick off with this very important topic today I want to let you in on a little landmark day as it were. Today is the day that my blog Colourful Keys which is at colourfulkeys.ie you if you’re not familiar with it is actually five years old which is amazing to me. I started that blog as a way to document what I was learning about piano teaching as I returned to it after a break and discovered all this amazing stuff and started getting into the creative side of things and games and creating my own resources and all of this stuff that all started five years ago today and it’s been an incredible journey so far. Now obviously I have the podcast and YouTube videos and the membership site and all of this stuff but it all began with that blog at colourfulkeys.ie five years ago today. Now it’s kind of appropriate that I’m speaking about such a important topic that seems like a little detail of running a studio but that as a new teacher as someone coming back to teaching after a break like I was back then you might not realize the crap you’re falling into here. So make up lessons it comes up again and again in piano teacher groups and forums and in emails I get from readers of the blog. First let’s just define what we mean by makeup lessons. Because a lot of the time these discussions that I see and even the conversations that teachers rather have had with parents in their studio I can see a confusion that’s happening and that’s that when we say makeup lessons we as teachers generally are including several things in that category that people might not expect us to be. So we’re talking here about no shows as a student just literally did not show up to their lesson. We’re talking about missed lessons where they either were sick or at the last minute they cancel or we’re talking about when they request to reschedule and this is the most common confusion I see because if they request a reschedule in advance is that a makeup lesson. No not technically but when we talk about makeup lessons we’re really including all of these contentious issues. So what’s the problem with makeups. Why shouldn’t we reschedule lessons especially for given enough notice. And I’m going to say right off the bat that I think that you shouldn’t. But why not. Well if you’re full, if your studio is full and your timetable in your studio is full of students then the only way to reschedule a lesson is if you take up your personal time. So teachers are teaching on a Saturday morning or if they already teach on a Saturday morning they’re starting earlier or they’re staying later it’s digging into your personal time in your week. And I don’t think that’s fair. You can’t rely on your schedule if this is your system. You can’t set up anything. I mean maybe if you had set an appointment you wouldn’t reschedule a lesson to that time. But you should have freedom to do whatever you want with the rest of your week when you’re not scheduled to teach and when you have makeup lessons that can build up and shuffle things around all the time that gets to be quite off putting in when you’re setting your own schedule when you’re figuring out what to do with your time also. And I believe an even more important reason why I don’t think you should do make blessings even if neither of those things bother you is that I think this is the wrong mindset for parents. I see so many problems happen down the track. And the story before that happened in the teacher’s studio is that they gave them this allowance and that allowance and that all the special dispensations. And the thing is when you do that people expect it more and more and more. That’s the way it works. You have to set up boundaries otherwise you can’t blame people for wanting things to continue in the same way or wanting basically you to be as flexible all the time. Don’t make exceptions to these things because when you do that’s when the mind set of parents gets all muddled up and they think about lessons in a different way than we want them to. I’ll talk about that mindset issue a little bit more later. But first let’s talk about why parents or teachers everyone might even expect to make up to be part of a music studio. Why? Why do they expect it? And what’s often cited is the fact that dance studios or soccer clubs or any other kids activity, it’s not expected that things will be rescheduled. If a student misses if a teacher misses that a whole different story and I absolutely think you should reschedule or refund lessons if you miss. But we’re talking about students missing here. And if a student can’t make it to their dance class. Tough luck. They don’t get the dance class that week. They don’t get to go to a different one. In most cases and even if they do that’s a preexisting so that’s not a problem for the studio. So why would they expect it from music lessons from private music lessons when they don’t expect it in other circumstances. And why do teachers expect to have to give these makeup lessons in our circumstances. Well I believe it’s because music lessons feel like an appointment simply because in most cases they are one on one so they feel like scheduling an appointment at a salon or in a doctor’s. But here’s the thing if you scheduled an appointment at a salon or in a doctors you wouldn’t expect that to be reserved for you week after week for an entire year. And that’s what we’re doing for students. We are setting aside 6:30 on a Monday for a whole year for the weeks that we’re scheduled to teach for that year. That is such a different story. And even in some doctors clinics and salons and hairdressers and wherever else there actually is a 24-hour cancellation policy where you will be charged. Some of them take your credit card details and they do charge you if you cancel within a certain time period in advance of the appointment. So that frame of mind just does not make sense whatsoever when it comes to music lessons. But it does help to explain why this would even be a question when it comes to music lessons. What students are actually paying for when they join your studio is a weekly spot in your schedule. And they’re paying for that specific weekly spot in your schedule. They are paying for 6:30 on Monday not half an hour out of your week. That is a massive difference. The other thing they are paying for is everything else you do the professional development you put in the time you spend lesson planning, the time you spend attending conferences, the recitals, your prep time, renting the whole all the other stuff you have to do to do with recitals and anything else you offer in your studio in my studio. That includes for group lessons a year to recitals and of course all that other stuff. The lesson planning the books everything else that you do. That’s what being part of your studio means it’s more like a membership than it is half an hour out of your week. That’s not what they’re paying for. So it starts with you. And if anything I just said make you go. But is it really then. That’s where the problem is and that’s where I usually see the problem being. And I wrote about this in a post on the site called the make up lesson mindset. I’ll leave a link in the shown ups. Those will be at libraries teaching dot com slash 19. This is vital that you get your makeup lesson mindset correct or aligned with your policies rather. I’m not saying my way is the only correct way although I do believe it’s best way for students and for teachers. If you can think of your studio as being something people opt into in its entirety with a weekly spot in your schedule plus all the other things that you do and actually it might be useful if you make a list for yourself of all the other things that are included because you might be surprised about all the other stuff you do the admin time you spend but also the little extras that you organize for students, pizza parties to celebrate achievements or whatever else comes up during the year. That is part of being in your studio being part of your studio community. So if you can fix your mindset first and truly believe that there is no reason why parents should be entitled to make up for a lesson if they have to miss it. If you believe that they are committing as much as you are to that weekly spot and that they are reserving it out of your week rather than reserving half an hour 45 minutes out of your week then I believe your job will be so much easier going forward. So if you’ve convinced yourself that makeup lessons shouldn’t be on the table you need to set up some policies for yourself and establish how you’re going to do things going forward. So the first thing is whether you’re going to have any alternatives for students who miss a lesson or whether that’s just forfeited for the week. I recommend offering a couple of alternatives in my studio. I offer video lessons so that is where a student can send me a video in advance of the lesson and I will review it during the lesson and also provide feedback either in notes or with the video myself or book but I’m doing that during their lesson time that they had scheduled anyway so it helps to reinforce that they are reserving that time in my week. I can’t do anything else with it anyway and it gives them feedback on anything they need feedback on during the week. Another great alternative is Skype lessons. This is obviously only if your student is actually free during their lesson time but it does come up more than you would think because sometimes a student is contagious but not feeling ill and that can kind of sting for a parent because they know their child feels fine and could actually do with some entertainment. Something interesting happening in their day if they’re home from school but they can come to your studio and you don’t want them at your studio if they have chicken pox or something. So getting them on Skype is a great way to deal with that. It also works well a for example a parent is just going to be away that day. The parent who drives and they can’t make it to the studio but someone is looking after them at home. There’s no problem with setting up Skype and beside their home instrument or if a parent’s car breaks down that can be another great reason why Skype lessons could work. Or of course in terms of inclement weather. So this week in Ireland this year rather in Ireland we had a snow week a proper snow week with real snow that you really couldn’t make it through. Now a few students did walk to their lesson but you certainly couldn’t drive. We don’t have the infrastructure in this country to get people to piano lessons when we have that much snow. So Skype lessons were a great alternative to that and it meant that no one may say less than that week either. Those are the two lesson alternatives missed lessom alternatives that I strongly recommend and that I do in my studio. There is a third thing that I offer my studio but I don’t recommend this for all of you. I tell my piano parents to get in touch with me as far in advance as they can. If they’re going to miss a lesson and that if I have another student’s cancellation I will offer that to them. Now I don’t recommend this for everyone because if you are in any way going to be tempted to take time out of the rest of your week to schedule them for a time that doesn’t actually suit you or in any way compromise on under no makeup lesson policy. If parents get in touch with you or if it’s going to cause you any guilt to say no then I don’t recommend you do this. It doesn’t bother me and I’m very good these days about saying no to these kinds of requests when I do so but I would prefer to teach the students there not to teach them. I like seeing all my students and I like teaching them week to week and seeing their progress. So if they get in touch with me with as much notice as they can pending on the circumstances that might be months or it might be a week. But if I have then another student council that week I will get in touch with the first parent and say listen you can have this other time where you can swap with each other. That kind of thing I will say most of the time I can offer it and I say that to them upfront but if the option is there that if there’s any chance that I can reschedule that for them I will I’ll do my best but I can’t guarantee it. And I say that in my policies and I say that to parents as I’m letting them know about these policies. So those are the three recommended lesson alternatives that third one with a strong caveat. Video lessons where students send you a video in advance, Skype lessons online lessons, FaceTime whatever you want to use if your student is free at the scheduled lesson time but can’t make it to the studio for whatever reason and then cancellations or swap lists that you either offer to parents or students yourself or you have them organize between each other but only if you have a strong stomach and you’re going to be able to say no when it’s necessary. Now the make up lesson alternatives that I see around that I don’t recommend are top of the list for me. Group lessons. Now this may surprise you because I am absolutely not anti group lessons. I love doing group workshops. I love recommending them to teachers because it’s a great opportunity to get students together build the community get them to improvise and play ensemble pieces and play theory games of course from the vibrant music teaching site or wherever else you get your games. But what I don’t recommend is this idea of treating the group lesson as a make up and I feel like this is really just I’m sorry to say it but a bit of a copout on the part of who are moving away from offering makeup lessons for any and all circumstances to trying to move to no make ups and they’re just they’re feeling like it’s going to be a really hard transition. And so they offered this as a way to kind of couch it and I don’t think that makes any sense because they also tend to say that everyone anyone and everyone in their studio can attend these group lessons. OK so then what those group lessons are is just a bonus as a part of being part of your studio. Same as mine. Don’t tell them that those are acting as makeup lessons because that encourages parents to think I am entitled to a makeup lesson but my teacher can’t offer it so I’m getting this as a way to make up for that. That’s not what’s happening. They are not entitled to a makeup lesson. You do not have to offer one and group lessons are just an awesome bonus of being in your studio and part of the whole package. So I really don’t encourage you to frame group lessons group workshops in that way. As painful as it might feel to move to no makeup lessons. It really isn’t going to be that bad. And if you can as I said before fix your own mindset so that you really believe that you do not have to offer makeup lessons that no one is entitled to them and that it’s not quote unquote there to offer them. Then I believe you can get over that hurdle. The other thing would be some teachers will set aside a specific day like at the end of the month or something to offer makeup lessons. Obviously I don’t recommend that either because that’s still time that you’re working for free when you already set aside the previous time for that student. You didn’t get to do anything else with that time did you. Did you get to put another student in that spot. No because that was scheduled in your schedule. And now you’ve scheduled them an extra makeup lesson. It is the same thing whether you put them all on one day or not. And then I’ll just say that pretty much any other makeup lesson alternatives. I’d love it if you came back to me with one actually that you say. But what about this one. But I can’t think of another option that is actually a viable alternative other than some form of video lessons or sending notes during the lesson time or online lessons. I don’t think there’s any other alternative that really is genuinely the same commitment to that weekly lesson time that you have with those other two. Let me know though if you think of one and you think I’m wrong so selling this to your parents. Well this won’t work. I will say if they are paying for each lesson after lesson. So if you haven’t moved to something like monthly but bailing or a semester or term based tuition is not going to work. If they are just arriving and giving you 30 quid at each week’s lesson convincing them to pay you double when they didn’t attend just isn’t going to make any sense to them even though if they paid you 120 at the start of the month it might make sense to them. It’s not going to work if they pay at the lesson for each lesson. So first things first change that policy while you’re doing this or before it and henceforward act like this is just the way it’s done. OK. This is the way you do things. This is how it’s done. This is what’s fair and if you truly believe that you’ll be fine and of course bear in mind the almost over said phrase but it is very important. No is a complete sentence. If people are pestering you for makeup lessons and you’ve already explained your policies why they’re in place and what they’re receiving for their tuition in a calm and friendly manner. Then you just say no not sorry I can’t offer that. But just now. Not happening. They can’t have a makeup lesson. That is not the way your studio works. And you need to have confidence in your own policies and the value that you offer near studio. Because I’m sure it’s awesome. You’re listening to this podcast right now that is part of what you’re offering. You’re learning more every day becoming a better teacher. Lesson planning. Doing all the admin and providing that weekly lesson. So you are worth it and I hope you have the confidence now to go forward. Fix your make up lesson policies. If it needs fixing or just double down on it. If it was already ok but you’d been backing off it a little bit go forward and be confident that you are doing the right thing. This is what’s fair for everyone and that if you do lose students over this they are not the right students for your studio. Plain and simple. Okay guys I hope this has been useful. I’ll catch you next week on another episode of the music teaching podcast. Until then happy teaching. Bye for now. If you’re a vibrant music teaching member you can now find the recital program and poster template in the library and make your next recital that much easier to prepare for. Just copping to the library and you’ll see them right at the top. And if you’re not a member then go to VMT.ninja to signup today.